When we lived in NYC, Gabriel and I used to use Groupon-type deals ALL the time. It was a way that we could go out to try new restaurants without spending a fortune- and the opportunities were endless as we got new offers at least daily from Groupon, living social, yelp deals, buy with me, KGB deals etc. When we moved to Florida, it was one of the things I knew I’d miss- in fact, we even included it on our ‘will miss’ list on our blog: byebyeny.wordpress.com . The offers here are few and far between, and usually for activities and spa services as opposed to dining. Imagine my excitement when, after our first month of living here, we finally received a Groupon offer for a restaurant we’d been wanting to try called Brasserie Belge in downtown Sarasota. Most of the offers I see are up near Tampa or St. Petersburg, so I was really happy to get a local one, for a great deal, just 20 minutes from where we live. I jumped on it and called for a reservation. My father, who had strongly recommended the mussels here, also gave us a great tip that if you sign up for emails on their website, you can print out a coupon for a free crepe dessert. Score! We went for date night last Saturday and were seated right away outside, as requested. Our waiter came out right away to offer sparkling or flat water, tell us the specials and take our drink orders. I decided on a ‘Hot and Dirty Martini‘ which was absolut peppar vodka, dry vermouth, olive juice and blue cheese stuffed olives and hot peppers (which were AMAZING) I loved my cocktail and could probably have really spoiled my dinner with a few more of those delicious olives. Fresh, soft bread and butter was brought to us soon after. It was fine- but nothing special and fairly unremarkable. This was actually a good thing since we had lots of food coming and I’ve definitely been known to fill up on bread before the meal arrives. 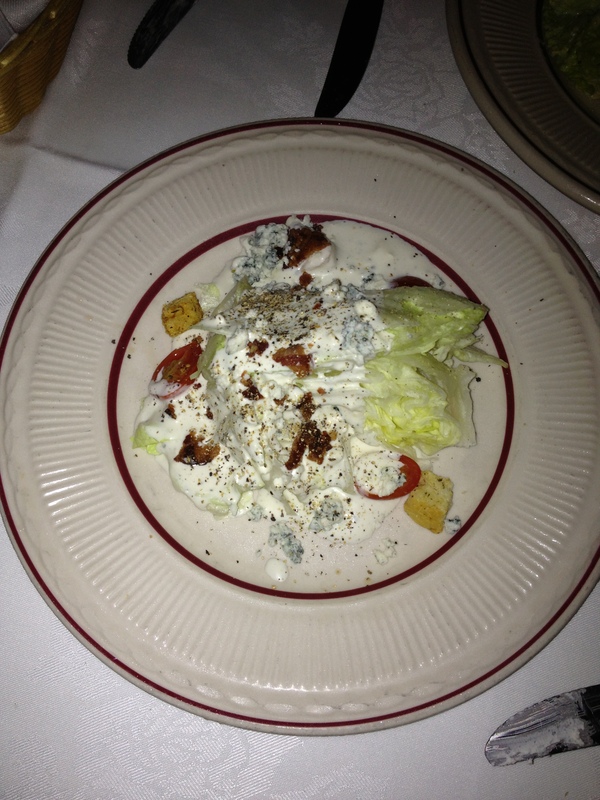 For our apps, we shared the Salade Brussels; Iceberg lettuce, shredded parmesan cheese, hard-boiled egg, croutons, Caesar dressing. I was fairly disappointed with it, but it was really my own fault for not noticed the ‘iceberg lettuce’ part. I was expecting a classic Caesar, but it was really boring. The dressing had almost no flavor, and the personality-less lettuce didn’t help things at all. 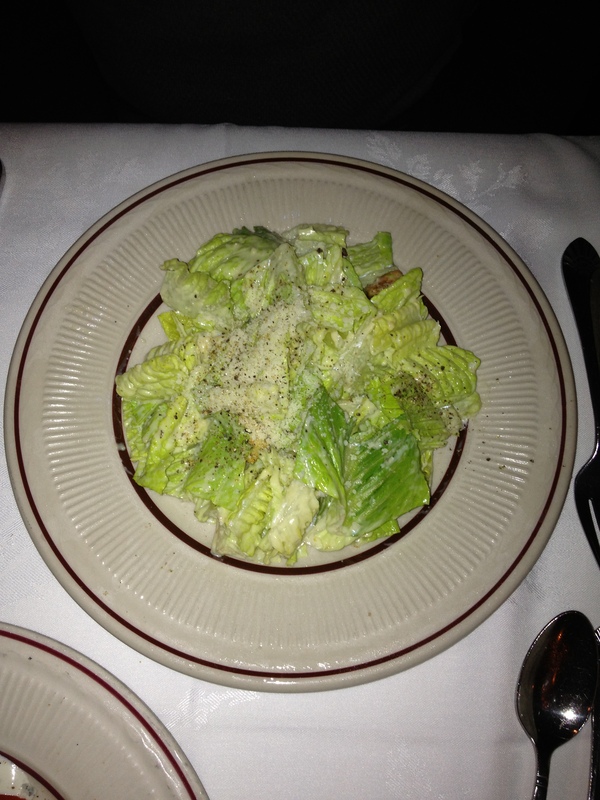 The thinly shaved parmesan was plentiful, but couldn’t really support the rest of the salad. Even the croutons were sadly bland and I really would have really liked some anchovies or lemon to make it come alive. Oh well. Our other app totally made up for the first one. 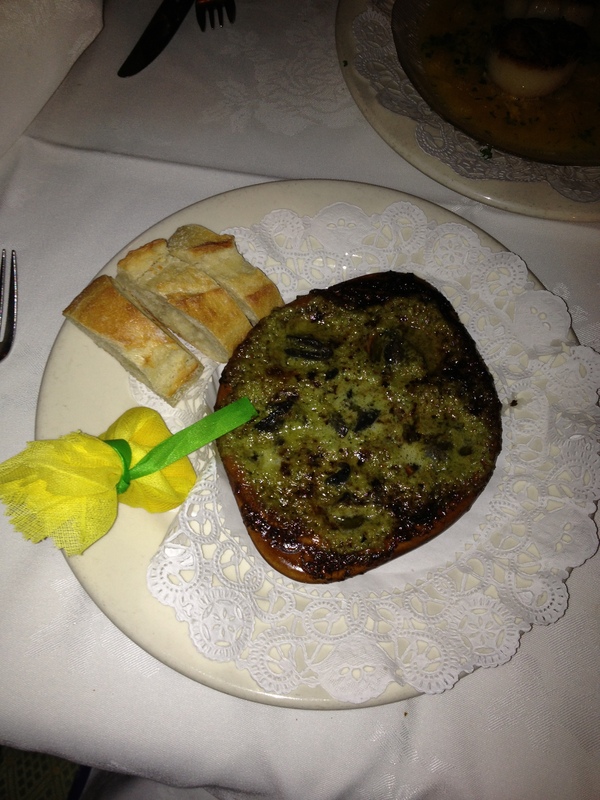 We ordered the special which was sauteed calamari and shrimp with olives in a creamy tomato sauce. It was outstanding. The shrimp were huge and cooked perfectly and the calamari was fresh and not at all chewy as it often is. The kalamata olives still had a nice bite to them and the sauce was creamy and warm and served as mature comfort food. Total winner. For our entrees, we shared the Mussels Tomate and the Meatballs “simmered in a sweet liège sauce of reduced fresh apples and pears”. It, like the mussels, were served with Belgian fries. The fries were served with a mayo-y sauce that was delicious and the twice-fried fries were awesome- super crunchy and just the right amount of salt. The meatballs were amazing- the sweet sauce they were served in reminded me a bit of Swedish meatballs– but were uniquely seasoned in way that was both sweet and savory. The mussels were fresh and cooked perfectly- and the portion was very generous. It’s understandable why most of the menu consists of different flavors of mussels and meatballs- they know what they do well and have made a great niche for themselves doing it. Overall, I really enjoyed my meal. Our waiter was friendly, knowledgeable and very attentive. 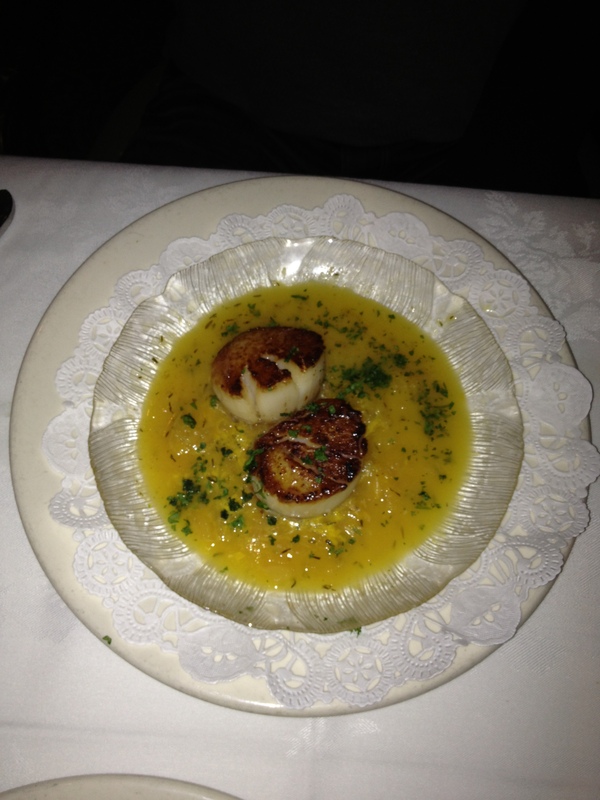 The prices were reasonable, made even more so by our Groupon and our free dessert. The atmosphere, including a talented pianist/vocalist, was lovely and sophisticated. We’ll definitely plan to go back!